The HTLSPIm is a Master Serial Peripheral Interface (SPI) controller. The controller can be used to interface to a wide range of SPI slave devices such as ADC, DAC, CAN, Ethernet, SD cards, Display controllers etc. To minimise the CPU overhead the HTLSPIm is enhanced with user configurable FIFOs, Interrupt and DMA support. To support as many SPI slave devices as possible the HTLSPIm can be programmed for a wide variety of configurations. The Slave Select (SS) signals can be individually be programmed for active high or active low. The first SCLK edge after SS has been asserted can be delayed for up to 3 SCLK periods. For streaming purposes, the SS signal can make a transition between each word which is required for some devices which latch or output data on the rising edge of SS. A programmable 8 bits divider can be used to generate an SCLK clock from clk/2 up to clk/256. The HTLSPIm can be programmed to start filling the FIFO as soon as a transition is detected on the MISO pin. This is useful for Secure Digital memory cards which start a response byte with a 0. The HTLSPIm core is written in generic synthesisable VHDL and can be used for FPGA or ASIC implementation. 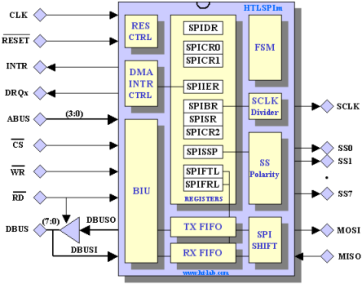 The HTLSPIm is delivered in synthesizable vendor neutral VHDL source. The source code is fully documented and can be synthesized using any modern synthesis tool. 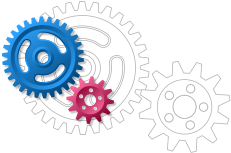 A self-checking VHDL testbench is included which verifies the different modes. For evaluation the HTLSPIm can be supplied on a low-cost FPGA development board from Enterpoint Ltd. The HTLSPIm is instantiated together with the HTL80186 processor, an HTL8259 Interrupt controller, an HTL8254 Programmable Timer, a 146818 compatible Real Time Clock, an HTL8255 Parallel Port Interface, a Watchdog timer and 40Kbyte of embedded SRAM. No VHDL source files will be supplied in this case.